My friends and colleagues know that I love wine. I love to drink, collect, learn about, and share wine. For the last few months I have been pondering what it might be like to write about wine. So, as an experiment, I sent a letter to the Editors of Wine Spectator. To my surprise, the Editors decided to publish the letter in the November 30th issue of the magazine. Below, I provide the letter that was published for your reading pleasure. I also include a small part, shown in italics below, that was omitted from the published version. I enjoyed reading Matt Kramer’s article “The Biggest Mistakes” (Oct. 15). I agree with Kramer on the three points he raises. However, I would like to offer the following three as my own perceptions of the biggest mistakes people make when choosing wine. First: volume instead of variety. I have been collecting wine for over 12 years. A lot of my friends ask me if I stock up on wines that I like. While, the obvious answer is yes, I do take great care to keep a diverse collection. Rookies make the mistake of loving one particular kind of wine (e.g. Cabs or wines from Italy) and then blinding themselves to other regions and varietals. My suggestion: for every five bottles of wines that you buy from places that you know, try one bottle from an unknown region. Third mistake: not asking enough question. Too often, [people] who are just beginning to experience wines in a serious manner feel intimated about asking questions of wine makers or merchants, or even of sommeliers. Learning about wine is a lifelong quest. One very reliable channel for easily digestible information on wine is talking with experts. Most wine enthusiast and experts love to share their knowledge and opinions on wines, and they yearn for the opportunities to converse with people about wine. So do them a favor and engage them in a conversation. You will not regret it. I also like using http://www.cellartracker.com to keep track of all my bottles and to keep a watch on the drinking window- you must try it out. Excellent. 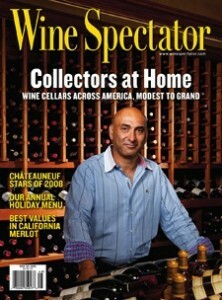 I have a list of my wine collection (though a bit dated) on cellartracker as well.